The second-in-command of a Mexican Mafia-linked East Los Angeles street gang that federal authorities say terrorized residents of the Ramona Gardens housing complex in Boyle Heights for decades was sentenced Tuesday to nearly 13 years behind bars. Victor “Grizzly” Barrios, 43, was sentenced by U.S. District Judge Christina Snyder to a 155-month prison term, reduced from 180 months to account for about two years served in federal custody following his arrest on conspiracy and drug trafficking charges. Upon release, he will be detained by U.S. Immigration and Customs Enforcement and deported to Mexico, according to court papers. Barrios was among nearly three-dozen members of the Big Hazard gang indicted in December 2014 under the federal Racketeer Influenced and Corrupt Organization Act, which federal authorities in Los Angeles have successfully used for decades to battle prison gangs and street gangs. 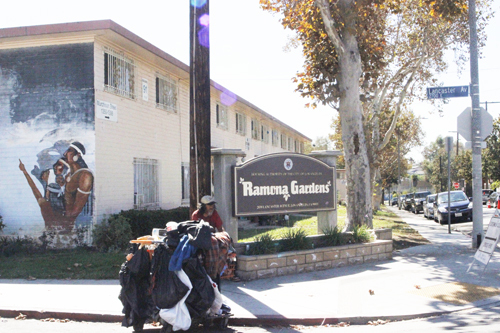 The Hazard gang takes its name from a park near Ramona Gardens and is believed to have around 350 members. In a letter to the court, Barrios acknowledged his “unwise choices,” and the former gang shot-caller admitted that he alone is responsible for his actions. Barrios said that prior to his arrest, he spent three years with Father Greg Boyle’s Homeboy Industries, learning how to be a pastry chef. He told the judge that he had enrolled in an internship program at Bouchon, chef Thomas Keller’s French bistro in Beverly Hills. “Not only did I learn the art of bread baking, but I was given the chance to work as an extra in a couple of TV series,” Barrios wrote. According to the indictment, Barrios’ gang distributes methamphetamine, PCP, crack cocaine, heroin and other controlled substances in neighborhoods it controls. Gang members are known to “advertise” their criminal acts by shouting references to their gang before or during a crime to cause fear, the indictment said. Hazard-related symbols are used in tagging throughout the neighborhood. Prosecutors say the gang uses murder, assault and threats to keep its members, associates and other Latino gangs in line. The Mexican Mafia authorizes the gang to carry out the attacks, federal authorities said. The lead defendant in the 45-count indictment is Manuel “Cricket” Larry Jackson, a Mexican Mafia member who allegedly oversees the activities of the Hazard gang. The indictment alleges that under Jackson’s control, the gang commits a wide variety of crimes, most significantly drug trafficking, which generates revenues through the sale of narcotics and the “taxing” of drug dealers who operate in Hazard territory. Some of the revenues generated through “taxes” or “rent” are funneled back to Jackson and other members of the Mexican Mafia, according to the government. Jackson is awaiting trial in Los Angeles federal court in two separate cases. Two teenagers who went missing Wednesday in Boyle Heights and were feared to be suicidal have been found unharmed, police said early this morning. Police said the teens were together and identified them as 14-year-old Adrian Gonzalez and 15-year-old Jaylin Mazariegos,. No one saw either teen leave home, according to the Los Angeles Police Department Hollenbeck Division. Jaylin was last seen about 6:15 a.m. in the 2600 block of Alcazar Street, police said. “When her mother returned later in the day, she discovered that Jaylin, some clothing and her black BMX bike were missing,” according to a police statement. Adrian was last seen about 7:30 a.m. in the 1300 block of De Neve Lane, police said. Some of those messages made references to “Romeo and Juliet,” causing family members to fear they could be suicidal, reported the KNX 1070 radio station. The teens were found safe about 12:30 a.m. in the area of Martin Luther King Jr. Boulevard and Normandie Avenue, according to the LAPD. They were brought to the Hollenbeck station to be reunited with their families, police said. Update 7/20/17 to include LAPD announcement that the teens were found unharmed. Seven Los Angeles men were charged in a federal indictment with firebombing the homes of black residents in the Boyle Heights area two years ago in an effort to drive them out of the defendants’ Latino gang territory, prosecutors announced Thursday. The men were named in an indictment handed down June 22 and unsealed Thursday. They were charged in connection with the May 12, 2014, firebombings in the Ramona Gardens housing project. Hernandez and the other defendants met again on May 11, 2014, and Hernandez distributed materials to be used during the firebombings, including disguises and gloves, prosecutors said. General Vanita Gupta, head of the Justice Department’s Civil Rights Division. The firebombings were carried out shortly after midnight on May 12, 2014. Fire officials said at the time there were no injuries, and only “minimal damage” was reported. Jonathan Portillo, 21; and Joel Matthew Monarrez, 21. They were all charged with conspiracy to violate civil rights; conspiracy to use fire and carry explosives to commit another federal felony; attempted arson of federal property; using fire and carrying explosives to commit another federal felony; aiding and abetting; and violent crime in aid of racketeering and interference with housing rights. making a false statement to the FBI. Saucedo, Garibay, Portillo and Monarrez are facing up to 110 years in prison if convicted. Hernandez and Farias face up to life in prison, and Felix faces up to 115 years. 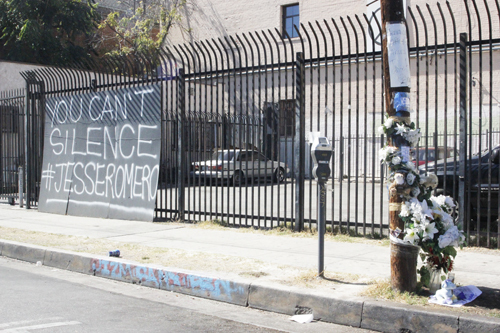 Farias, Felix, Garibay, Portillo and Monarrez are scheduled to make their initial court appearances in downtown Los Angeles Thursday afternoon. Hernandez and Saucedo are in state custody and expected to be transferred to federal detention next month. “I am very proud of the partnerships between our agencies that enabled us to investigate and apprehend these violent offenders who preyed upon our community in a manner that will not be tolerated,” Los Angeles police Chief Charlie Beck said.